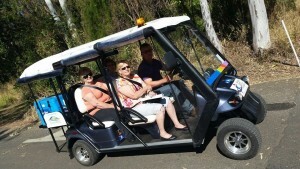 VISITORS to Bundaberg Hospital now have a new, easy way of transporting to and from the car park areas. 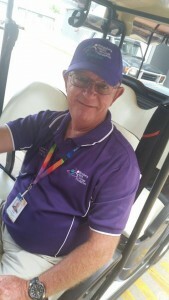 The Bundaberg Health Services Foundation established a golf cart into the new patient transport system in conjunction with the Wide Bay Hospital and Health Service’s new Cancer Care and Oral Health Building which is located behind the Ambulance Station. The golf cart was purchased with beneficiary funds from the 2013 Mayor’s Ball as well as funds from a charity golf day sponsored by SSS Strawberries. The six-seater golf cart with all weather-protection that will run between the new unit, drive through the car parks, past Rotary Lodge and to the hospital. Foundation volunteers operate these carts on a Monday to Friday basis from 9am to 4.30pm. People interested in volunteering with this project should telephone the Foundation office on 4150 2863. The Foundation has also introduced a new service at the new Cancer Care Unit. Our volunteers now serve tea and coffee and have a chat with those receiving cancer treatment. 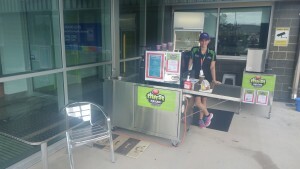 The Foundation has established a coffee cart at the Bundaberg Hospital’s new Cancer Care and Oral Health Unit. 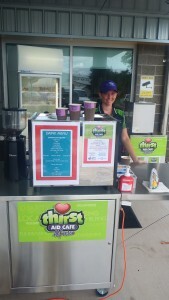 It offers barista style coffee using Byron Bay Beans and a selection of hot and cold food.